The MY Exercise Library section is where you will find the global exercise library. All subscribers will have access to the exercises within this library. The exercise library currently has over 550 exercises and is growing quickly. This should give you access to most if not all exercises you will need for your patients. However, this large number of exercises can make it difficult to find what you need. To help with this we have added several search filters at the top of the screen. 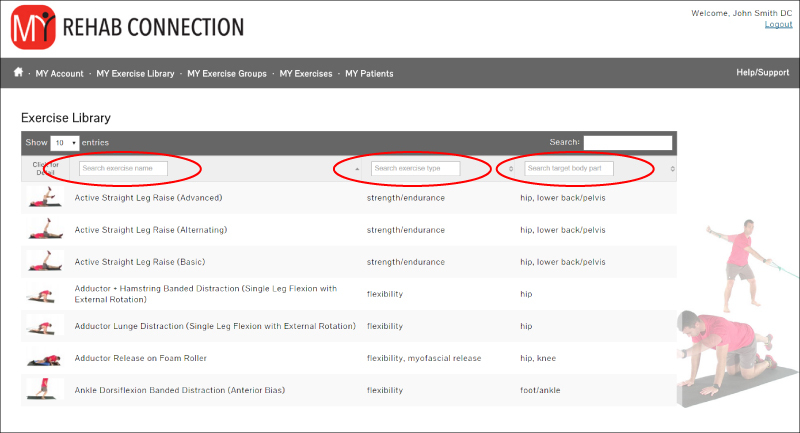 Search By Exercise Name: In this field you can search by exercise name by typing all or part of the specific exercise name. We have tried to include exercise names as they are most commonly known but, but have also tried to include the muscle group, joint, and movement direction in the exercise title when possible.